Are you violating patent laws in your basement? Patent laws have changed since this article was published in 1966, but the tenets are basically the same - do your due diligence on prior work assignment before publishing any publicly accessible product (print or physical). Since part of Popular Electronics' raison d'être is to provide circuits for hobbyists to build and benefit from, the lawyer who wrote this piece focuses on such applications. He claims, at least according to 1960 patent law, "There are court decisions which hold that experimental use of a patented invention for the sole purpose of gratifying curiosity or a philosophical taste, or for mere amusement, is not an infringement." HOWEVER, before you conclude that this must still be the case, read this synopsis from the Ius Mentis website titled "Crash Course on Patents," wherein is stated, "In most European countries, the exclusive exploitation rights granted by a patent are restricted to commercial exploitation. A private person who builds the patented invention in his own home for his own personal goals cannot infringe on a patent... U.S. law is more strict. It forbids anyone from making, using or selling the invention, even when the use is strictly personal." I'm not a lawyer, and I don't play one on TV, but my unsolicited advice is to be real sure of your legal standing before going public with any work be it electrical, mechanical, chemical, etc. The bank account you save might be your own. Most electronics experimenters are aware that almost every circuit diagram or construction project published in Popular Electronics has - in some form - been patented. And, as electronics technology becomes more complex and/or sophisticated, the chances of and opportunities for patent infringement are that much greater. Construction projects utilizing the most modern components are always built around existing patents. The following article was prepared for Popular Electronics by a Registered Patent Attorney. 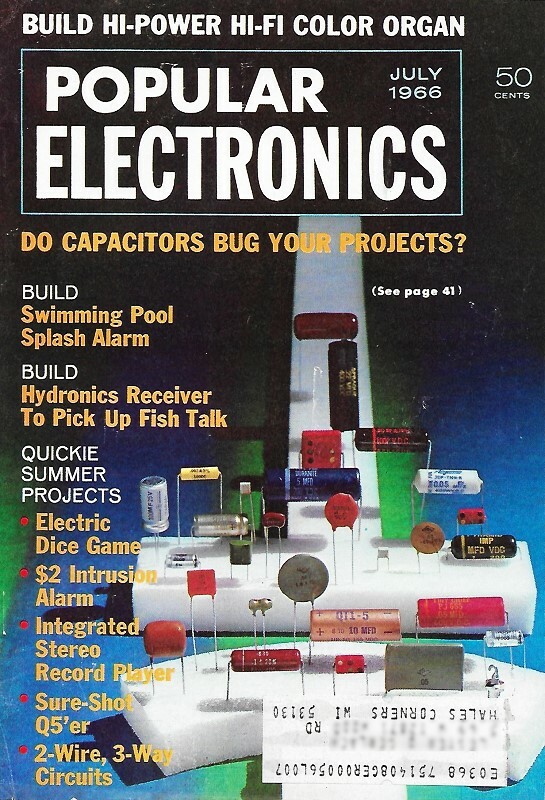 It explores some patent problems that could arise from building electronic projects published in this magazine and any of the other electronics magazines, as well as various handbooks. Unlike a patent, which is a "negative right" (it excludes others from making or using). this article looks at the positive side of things and states that experimenters CAN build projects for their own enjoyment. Many currently available transistor and tube handbooks and other manuals containing electronic circuit diagrams contain a warning similar to the following: The electronic devices and circuits disclosed herein may be covered by patents of the John Doe Company or others. The disclosure of information herein does not grant a license under any patents covering such electronic devices, such circuits or combinations of such electronic devices with other devices or other circuit elements. Some readers may have never noticed this warning, others blithely ignore it, and some may not fully understand it. Therefore, a brief discussion of such warnings should be of interest-and could save someone money! The Patent Owner. Many publishers of literature disclosing circuit diagrams are in the business of manufacturing and selling components such as transistors, tubes, and other basic electronic devices. Frequently, they also manufacture equipment using these components in various combinations and circuit arrangements. Since these manufacturers want to sell their components and equipment to the widest possible market, they need to publish information about the components and how they can be used. Very often, the components themselves and many of the circuits in which they are used are patented or are the subject of pending patent applications. These patents (and applications) might be owned by the manufacturer, or by another firm from which the manufacturer has a license. Or, in some cases, the patents might even be owned by an independent party who has discovered or invented new ways of using the components. In any event, the manufacturer-publisher wants it clearly understood that just because the information is published, it does not follow that the reader is free to exploit this information commercially. The patent owner still intends to benefit from his patent rights and may require a user of any patented invention to take a license. In a patent infringement lawsuit, the court can award damages adequate to compensate for the infringement "but in no event less than a reasonable royalty for the use made of the invention by the infringer, together with interests and costs as fixed by the court." In some instances, the court may increase the damages up to three times the amount found or assessed." Faced with these stringent laws, what risk is there in building circuits disclosed in publications? It depends to some extent on the purpose for which the circuit is being built. The Electronics Hobbyist. It is common knowledge that electronics experimenters and hobbyists are continually building circuits they find in publications. Frequently, many of these circuits are patented. As a practical matter, it is impossible for a patent owner to know which hobbyists and experimenters are actually infringing his patents. Fortunately, however, the position of experimenters and hobbyists rests on sounder legal ground. There are court decisions which hold that experimental use of a patented invention for the sole purpose of gratifying curiosity or a philosophical taste, or for mere amusement, is not an infringement. But this rule cannot be invoked to protect persons (or companies) who use a patented invention commercially, as in the course of business or for profit. Commercial use of patented inventions of others invites a charge of patent infringement. This is true even though the publication from which the particular circuit was obtained did not contain a notice that the circuits disclosed therein might be patented. Most companies are very careful to police and enforce their patents - against the small operator as well as the larger competitor. This is sound and necessary business practice. The patent owner can require an infringer to stop manufacture, use, or sale of infringing equipment, or he can require the infringer to take a license and pay a royalty. Having to stop manufacture and sale of apparatus could be costly or even ruinous to a small operator. Taking a license, even at a reasonable royalty rate, is another cost item on a product which could create problems if not considered in advance. If patents are found which might be infringed, you have a chance to consider the desirability of some sort of license arrangement with the patent owner, or run the risk of a charge of patent infringement action. Only a few high points on the subject of patent infringement are covered here. 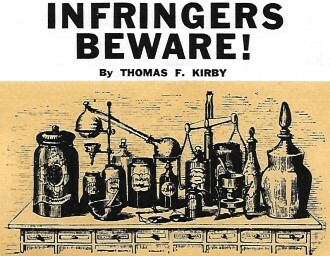 If you have any doubts about incurring liability for patent infringement through the use of circuits found in publications for commercial exploitation, the sensible thing to do is consult a patent attorney, before you make a big investment.